Compensation is being provided by Skinny Cow. The opinions and content expressed in this post are 100% mine and are not indicative of the opinions or positions of Skinny Cow or the WoCave' campaign. A week or so ago I told you ladies about Skinny Cow's summer Wocave' campaign and how it encourages us to find time to play in our own personal "woman cave"; embracing the things we enjoy and sharing it with not only our girlfriends, but also carving out time for ourselves. Last week Skinny Cow sent me and three of my girlfriends on a Wocave' mission and let me tell you, it was one heck of a ride. 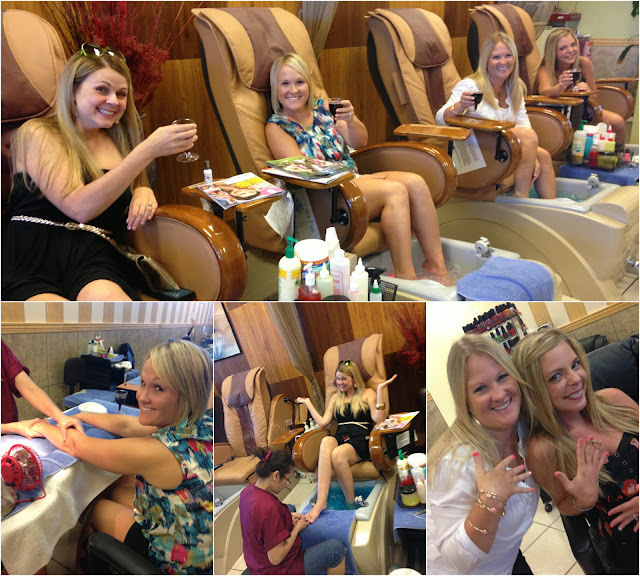 It was tough orders to follow and accomplish...mani/pedis, wine, shopping, sushi and four hours of non-stop smiles. It was a rough night. Let me explain a little more, Skinny Cow delivered a big, pink ribbon wrapped Holstein cow printed box with glorious goodies tucked inside. I couldn't wait to see what my Wocave' mission was. I knew it was going to be good, but not this good. 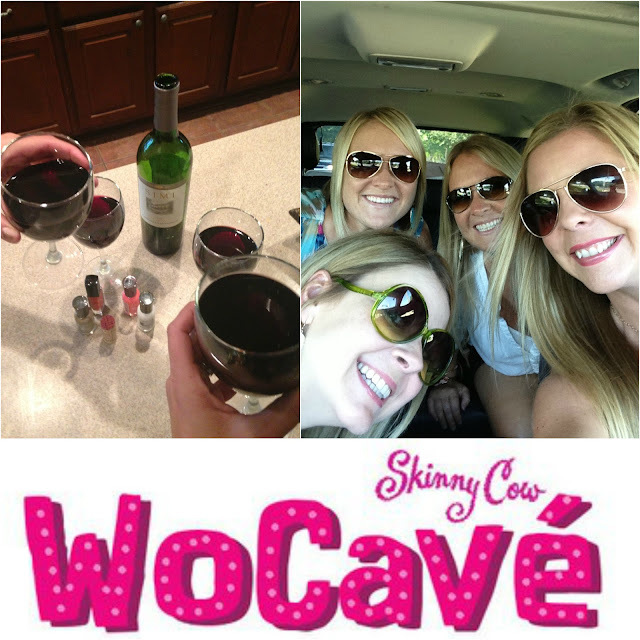 Skinny Cow nailed my vision of a Wocave' (woman cave) and exceeded my expectations. We started off with a bottle wine at my casa and contemplated polish colors. Yes, I know, so deep and mind stimulating. Who cares. It was fun. Then we loaded up in my Yukon and headed to our first stop, the nail salon. How cheesy are we? FYI, your mind isn't playing tricks on you, the two pretties in the back are identical twins. Again, cheese moments with massage chairs, vino, gossip mags and big smiles. Does your nail salon serve wine? Well, ours does and it was icing on the Wocave' cake. 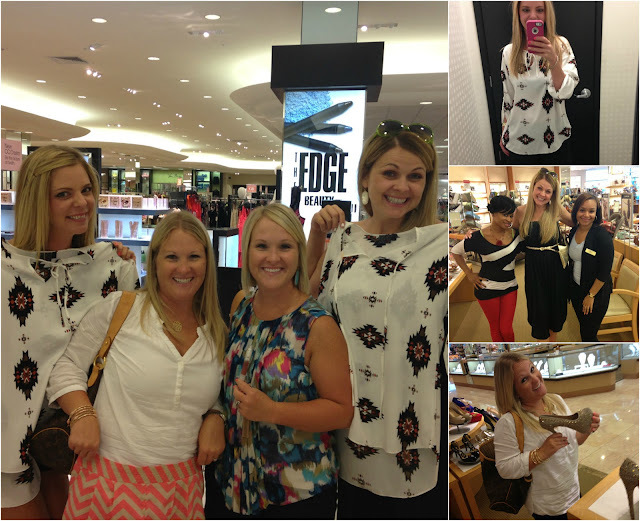 Next up, a little bit of speed shopping at Dillard's. We had a little over an hour to shop and may or may not have closed the store down. Would you expect anything less? Yes, my girlfriend and I chose the same top (as seen in the styled look above). She and I have always been known as Twinkies. I think we own about 20+ of the same things. Hey, we have good taste. The cutest twins on the planet grabbed a pair of chevron shorts and Stila lipgloss. Getting your toes done and shopping will wear a girl out. Can I get an Amen? We were famished, I tell ya. 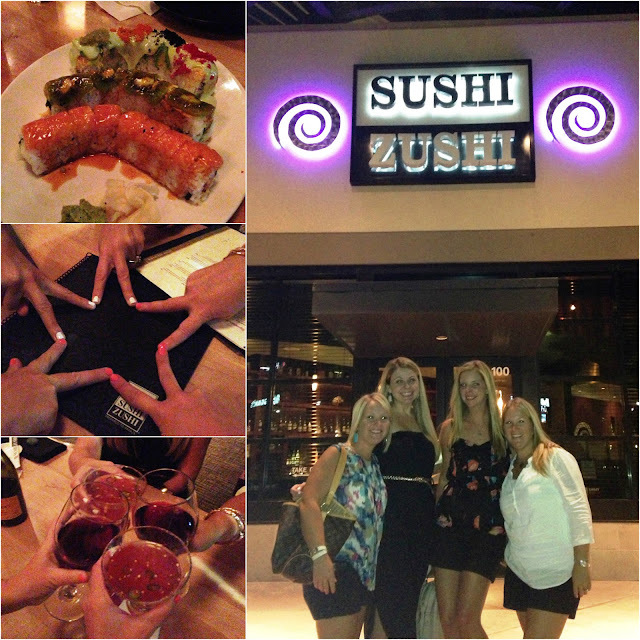 So, we did what any smart and savvy girls would do, we ended the evening with a little sushi and cocktails. This was probably the best part of the mission, stuffing our faces with raw fish, recapping the night and just catching up on girl stuff. The most perfect Wocave' moment. Call me shallow. Call me pretentious. That's okay, but this is how I like things to roll in my Wocave'....friends, mommy juice, mani/pedis, shopping, sushi and making a star shape with our freshly painted nails (see above photo). I can't wait to give you guys the scoop on my second Skinny Cow mission. I am not sure how they are gonna top this one. Stay tuned. What does your Wocave' (woman cave) look like? Are we sisters from another mister, or is yours completely opposite of mine? So, enough about my treat, I have a treat for you! You guys, get crazy about this one because it involves a chance to win $100 in jewelry. I met Jessica with Dahilia Lynn just a few weeks ago and her blog drew me in immediately. Her eclectic style and way with accessorizing is beyond perfection. Her style is one that you won't see replicated on every other blog. It's fun, whimsical and her charismatic personality radiates in every post. I love how she isn't afraid to step out of the box and create unconventional looks that I would have never thought of. She is a new style inspiration of mine and am sure you will feel the same way once you visit her blog. Jessica from Dahlia Lynn is not only a style blogger, but is an Etsy shop owner selling some of the most exquisite and lust worthy vintage inspired pieces that you will have a hard time finding anywhere else. Here are a few of my favorites. Get ready for your eyes to widen. I know mine sure did. Today, Jessica is offering one lucky lady $100 to her Esty shop, Dahlia Lynn. Yes, you read that right, $100 for you to shop! Man, I wish I could enter this giveaway. Holy smokes, I can envision every single piece sitting pretty around my neck, on my wrist, ears or fingers. I mean it, her offerings are close to one of a kind. Go see for yourself at Dahlia Lynn. How perfect that she ships out of Nashville, because I'm right next door! ;) I LOVE the Vintage crystal necklace! So vintage yet totally right now with the jewel statement necklaces!! Looks like you had so much fun with your gfs! You deserve some good girlie time with your friends! The Lola necklaces are amazing! What a fun evening with your friends! That star photo is adorable. Love your KS earrings! Love this outfit and that top is so gorgeous. Love the antique gold locket! It is just so sweet. A super fit fun event , woot! It sounds like you and your friends had so much fun! I love your top, so pretty! SO! FUN! Skinny Cow is WoCave mission is GENIUS. Looks like you had a fabulous night!!!! So much fun!! I haven't had girl time in so long. I love this look! The vest is so fun with that blouse. Sounds the like perfect night...minus the sushi. :) Cute outfit! Oh my gosh, the DahliaLynn Vintage necklace is BEAUTIFUL! I can't even imagine how gorgeous that would look in person. 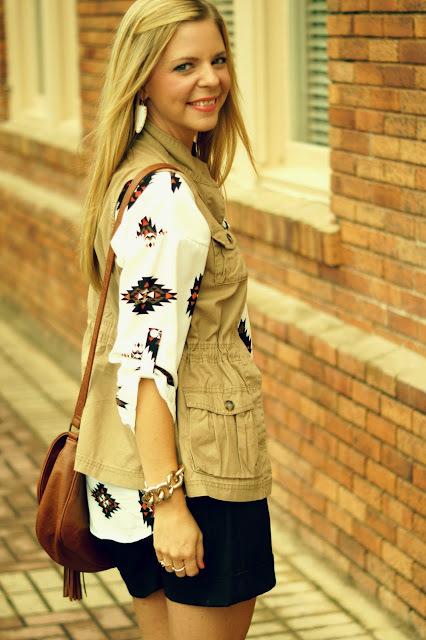 You are SO GOOD at layering–I love what you put together here, that vest is sure to be a staple come fall! Ohhhh the bag is from Express! I've been dying to know! I like the The Amelia necklace. Thank you for this nbeautiful giveaway! I love the Aztec print top on you! oh my gosh i LOVE this!! what a fun girls' night!!! well this looks like a blast!! so much fun! And I'm gonna need that top! I love the Lola turquoise necklace. Aw this girls night looks AWESOME! I'm obsessed with that top. OBSESSED. I would love to have an outfit like yours in my wardrobe. It's so versatile and looks comfy. Looks like you girls had a blast! I love the vintage bib necklace withe the blue rectangles! This looks like so much fun Shanna! Can I move to your town? The turquoise and silver necklace from the Vintage collection is beautiful!!!! Oh, we're totally sisters from another mister. This sounds like the perfect girls' night :) Love the top you two chose, so cute! i love the DahliaLynn Vintage! I love the DahliaLynn Vintage necklace. i love the triangular rhinestone clip-on earrings! Oh my gosh...that looks like the perfect night! Wine at that nail salon?! So cool! And I love the Amelia necklace from Dahlia Lynn etsy shop! Love The Amelia necklace but there are so many great pieces! Love the DahliaLynn Vintage necklace! Definitely the DahliaLynn Vintage!!! How gorgeous! 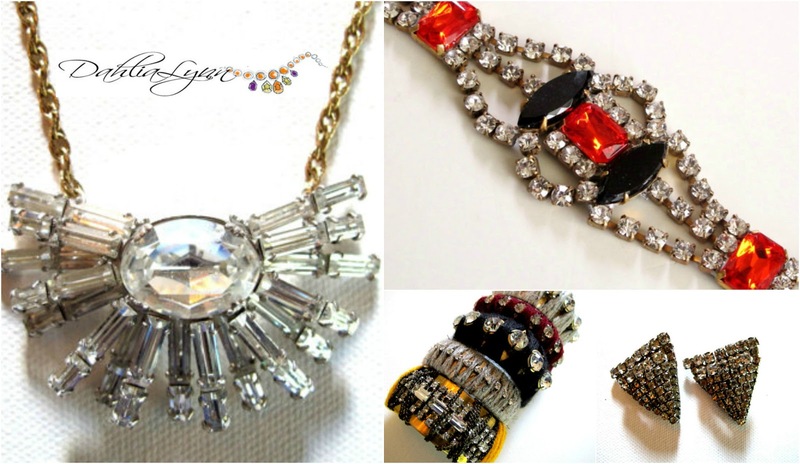 Everything is called "vintage"....but this specific necklace is GORGEOUS! She has some gorgeous stuff! THe Amelia necklace..thanks for the chance to win! My favorite piece is the DahliaLynn Vintage necklace featuring white, gold, and orange textured beads. I love the vintage tassel pendant necklace!